HACU is advising all member and partner colleges and universities that new technology program funds will soon become available, but that there is only a limited time to apply for $15.5 million in Technology Opportunity Program (TOP) grants. Please immediately forward this HACU Member Advisory to all technology program directors and grant executives at your institution. Proactive efforts are essential! Despite efforts to eliminate TOP, HACU and other organizations were successful in winning Congressional approval on February 20 to continue the program and appropriate $15.5 million for federal Fiscal Year (FY) 2003 for TOP. Because of this late vote, the National Telecommunications and Information Administration (NTIA) very shortly will issue a Notice of Availability of Funds in the Federal Register, which will describe the rules and deadlines for applying for a FY 2003 TOP grant. 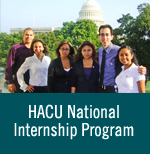 HACU has been advised that a very limited time will be available to prepare grant applications. Please immediately visit the TOP grant section at www.ntia.doc.gov/top to begin preparing a grant application. At stake is $15.5 million in new TOP grant funds. Time is of the essence, since the grant application period will be very brief. With dramatic cutbacks in state funding for higher education, HACU urges all member and partner colleges and universities to take advantage of all federal funding opportunities. Investigate TOP grant eligibility requirements now by visiting www.ntia.doc.gov/top or by directly contacting a TOP Program Officer at (202) 482-2048. Background: TOP was created in 1994 to provide grants to low-income and other under-represented communities lacking adequate technology access. Since its inception, the program has awarded more than 500 grants in all 50 states. HACU member and partner colleges and universities serve many of these low-income and under-represented communities. Note: TOP also is seeking researchers and evaluators to serve on review panels for the 2003 grant round. Please contact TOP directly at (202) 482-2048. Reviewer information also is available at www.ntia.doc.gov/top/grants/review.htm.